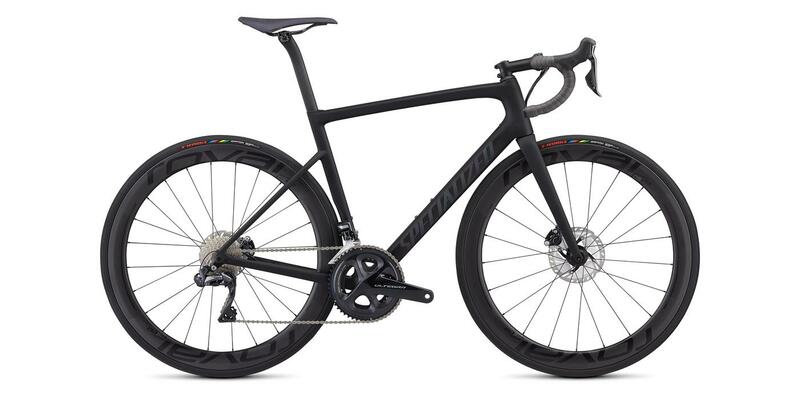 The Specialized Tarmac SL6 is currently one of our favourite bikes, a massive improvement over the old model with a lighter and aero optimised frame and a host of other smart upgrades. To say we were blown away by the ride quality of this redesigned bike would be an understatement. Fast it most certainly was, but it was the handling which is right up there with the most premium bikes such as Parlee or Colnago, a glowing endorsement of how significant an improvement the SL6 was. 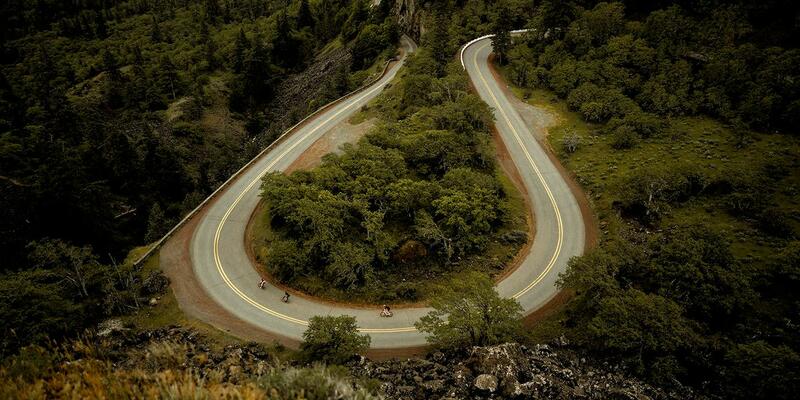 It was Barry's choice for the demanding Haute Route Ventoux event where it excelled. It first launched with rim brakes, but a disc brake version soon followed, though with just a single S-Works model available. Barry recently got to ride this bike in the Alps, you can read his first ride impressions here. With a £9,250 price, it was firmly in the upper echelon of the road bike world and packed with the best equipment. Dura-Ace Di2, Specialized's own carbon crankset and power meter, Roval CLX 50 wheels. A veritable superbike. Impressively, Specialized has already trickled down all this latest technology to a range of four much more affordable bikes, packed with all the same features but more price-conscious equipment, starting with the £2,250 Sport and riding all the way to the £5,750 Pro. That's nearly half the price of the S-Works version! How Specialized is able to offer the S-Works Tarmac Disc at lower prices is down to the carbon fibre. It uses the highest grade carbon in the S-Works, which it calls FACT 12r. FACT, in case you're wondering, is short for Functional Advanced Composite Technology and is the process the US company uses to develop its carbon frames. The premium carbon fibre, typically high-modulus, is pricey stuff, so to be able to offer the new Tarmac Disc at lower prices, it substitutes some of that expensive carbon fibre for slightly less expensive grade carbon. There's no shortfall in quality, the main difference is on the scales, they are slightly heavier, and a small hit on the ride quality. Other than the differences in carbon fibre, the frames are near identical. You're getting a frame with the same Rider-First Engineering, ensuring each frame size is optimised with custom tube shapes and layup. There's the same aero optimisation, from the shape of the down tube and seatpost and the lowered seat stays. There's more generous tyre clearance, you can fit a 28mm tyre, and Specialized has worked to improve the comfort by adding in flex zones to the frame and seatpost. The Tarmac Disc Pro (£5,750) is made from FACT 10r carbon fibre (the S-Works uses higher grade 12r carbon). It's fitted with the latest Shimano Ultegra Di2 groupset and hydraulic disc brakes, which offer the same excellent power and modulation as Dura-Ace. The Roval CL 50 Disc wheels use the same carbon rims as the more expensive CLX 50 wheels but different bearings and spokes. The Tarmac Disc Expert (£4,000) uses the same FACT 10r carbon frame and is specced with a mechanical Shimano Ultegra groupset and Roval C38 Disc Carbon wheels (a very impressive wheelset at this price point). We're loving the bold camo paint job but fear not a calmer green metallic colour option is available. 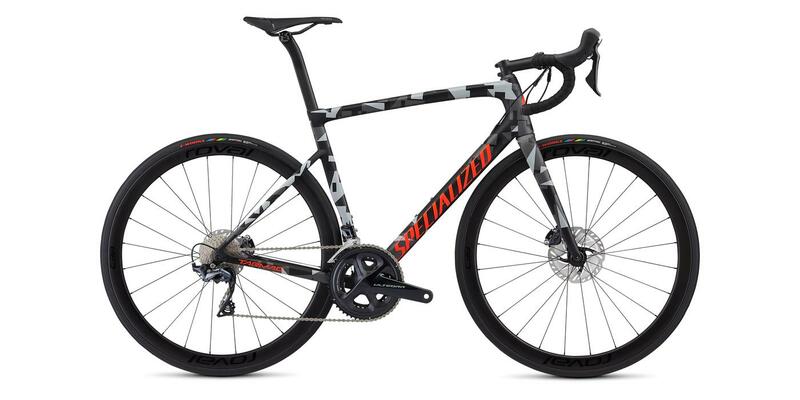 Using a frame made from FACT 9r carbon fibre, the Tarmac Disc Comp (£2,750) features a Shimano Ultegra mechanical groupset with hydraulic disc brakes and DT R470 wheels. Rounding out the new range is the Tarmac Disc Sport (£2,250) which uses the same FACT 9r carbon fibre with a Shimano 105 groupset and DT R470 wheelset. If you like to find out more about these new bikes please contact us. First shipments are expected in early July, and you'll be able to drop into one of our three stores to see them in the flesh. below: the alternative colour option for the Tarmac Disc Expert, Chameleon Green. This shimmering paint scheme really sparkles in sunlight. *As always at Bespoke we will include a bike fit as part of your purchase, and swap any contact points like-for-like at no extra charge to ensure the perfect fit.